In 1981 the very first dam project on the river, Tabasara I, was meant to supply energy to the Cerro Colorado copper mine. This project was ultimately canceled after being rejected by the local community. In 2007 the dam concession was given to Honduran-owned Generadora del Istmo, SA (GENISA) and renamed the Barro Blanco dam project – the current developer and project name. In 2008 GENISA took a stab at local consultation – they consulted a non-Indigenous town near the affected area. Later, the Environmental Impact Study of the project was approved, GENISA began to apply for carbon credits under the Clean Development Mechanism established under the Kyoto Protocol. The Barro Blanco Hydroelectric Project (PHBB) works are located in the districts of Veladero and Bella Vista, District Tole, Province of Chiriqui and use the waters of Tabasará to generate electrical energy, with a power generating plant with an installed capacity of 28.56 MW and a mean annual generation of 124.83 GWh, with a 258-hectare reservoir. The Ngäbe Bugle (or Ngöbe-Bugle), the largest indigenous peoples group of Panama, took to the streets on February 2012 to demand that all concessions granted without their approval be cancelled, including those for the controversial Barro Blanco Hydroelectric Power Plant Project. The Ngäbe population, the largest indigenous peoples group of Panama, some of them live on the Tabasara's riverside. There was peaceful resistance against the Barro Blanco dam. The project violates the laws that define the Ngäbe-bugle's regional territories, water rights and the self-determination of indigenous people the Tabasara. These protests, which blocked the Pan-American Highway for over a week, stemmed from the refusal of legislators to include article 5 of the proposed law 415 –as previously agreed upon– to prohibit all mining and hydroelectric concessions within the region of the Ngäbe Bugle. Violent repression by President Martinelli against the peaceful Ngäbe protests left three of them dead (Jerónimo Rodríguez Tugrí) and more than a hundred wounded. Communications were cut and human rights were severely violated. Adults and minors had been wounded. 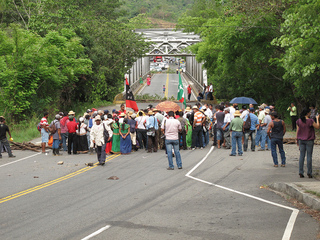 In March 23, 2012 a Ngäbe indigenous Panamanian, Onesimo Rodriguez, opposing the Barro Blanco hydroelectric dam project was killed. Local environmentalist and indigenous protests against the Dutch and German supported dam have re-started in recent weeks, as the project has continued despite a long-awaited United Nations report finding in favor of the indigenous community on the illegality of the dam. Already construction has advanced far enough to raise the water level of the Tabasara River, threatening to flood Ngäbe lands and villages when expected rains arrive in three months. These same communities will be drowned beneath a 258 hectare reservoir if the dam is completed. Peace negotiations between the government and the Ngäbe Bugle have since occurred. A compromise agreement between the two parties has resulted in the passing of Special Law 11, in force since April 2012. This new law cancels mining concessions and prohibits future mining. It also states that any future hydroelectric projects the government plans in the territory must be subject to approval by indigenous authorities and a referendum of the area’s residents. The Ngäbe Bugle people are to receive 5% of the projects annual billing as well. However, the contentious Barro Blanco dam will go ahead. The indigenous population living by forest agriculture and fishing will be displaced. As well as destroying forest and villages, the reservoir will drown boulders covered with petroglyphs important to the Ngäbe culture. They may be forced to move to relocation camps or urban areas to seek employment, which may result in cultural erosion, loss of language, and more. Project Details Barro Blanco Hydroelectric Project (PHBB) consists of the use of hydraulic Tabasará river waters, Chiriqui Province, to provide a power generating plant with an installed capacity of 28.56 MW​​ and a mean annual generation of 124.83 GWh, with a 258-hectare reservoir. The project has a central control house at the foot of the damn, located on the site “The Philippines” (Foot of Outlet). The project has been conceptualized with a Gravity Dam of 44.91 meters in height above the riverbed. The reservoir level is set at elevation 103 m.
The coronation of the dam will be located at an altitude of 109 meters and will have approximately 424 meters long. The flow rate multi-year site The Philippines, corresponding to 50.30 m3/s. The Eco Stream project is estimated at 3.5 m3/s. The Project Design Flow was estimated at 75 m3/s. Development of Alternatives Se cumpla la Ley 10 de 1997, mediante la cual se crea la Comarca Ngäbe-Buglé. Esta ley reconoce las autoridades o instituciones étnico-culturales, y la existencia del Congreso General, y los Congresos Regionales y Locales. Why? Explain briefly. The Barro Blanco Dam located in Province of Chiriqui use the waters of Tabasará to generate electrical energy, with a power generating plant with an installed capacity of 28.56 MW with a 258-hectare reservoir. The Ngäbe population lives on the Tabasara's riverside leads of peaceful resistance from February 2 2012 against Blanco dam, but after the Goverment’s repression and a former agreement the contentious Barro Blanco dam will go ahead. The project violates the laws that define the Ngäbe-bugle's regional territories, water rights and the self-determination of indigenous people the Tabasara. April 2014, "Ngäbe-bugle's families are concerned about their future if the dam is built. Yet they never had a chance to raise these concerns to their government, even though international law prohibits forced relocation of indigenous peoples without their consent. The Panamanian government approved the Barro Blanco project without consulting these Ngöbe communities". Ley 10 de 1997, mediante la cual se crea la Comarca Ngäbe-Buglé. Esta ley reconoce las autoridades o instituciones étnico-culturales, y la existencia del Congreso General, y los Congresos Regionales y Locales. Both ENDS, 2013, Will UN-rapporteur Anaya investigate Barro Blanco dam in Panama?